What is this resource about? This resource describes how images can be used effectively to communicate information and addresses how to make images fully accessible. The Examples provide ideas about how and why to use images to support comprehension. The Resources provide external links to sources of educational images. Provide multiple means of engagement: Images can improve retention and understanding and they can be used to make text more engaging and relevant. Provide multiple means of action and expression: When assessing students understanding of complex systems and processes, offer the option to have them demonstrate their understanding by creating images, charts, graphs or maps. Provide multiple means of representation: Images can successfully convey complex information, enhance understanding, and improve retention. Images can be used an alternative to text, audio, or video, or they can be used in addition to these other media types. This black and white photograph from 1936 shows a woman facing forward and two children resting their heads on her shoulders, facing backwards. The woman has her fingers and thumb resting against her jaw. Her brow is furrowed, and her mouth is downturned. 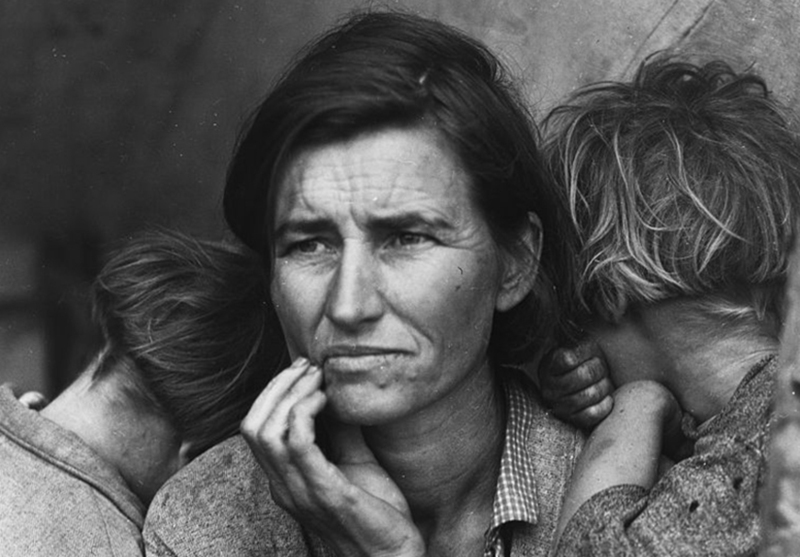 Images, like "Migrant Mother", can help students make contextual and powerful emotional connections to course content that might otherwise seem irrelevant. Historical events gain a human face that help students make connections to current situations. This photograph is freely available from the Library of Congress. 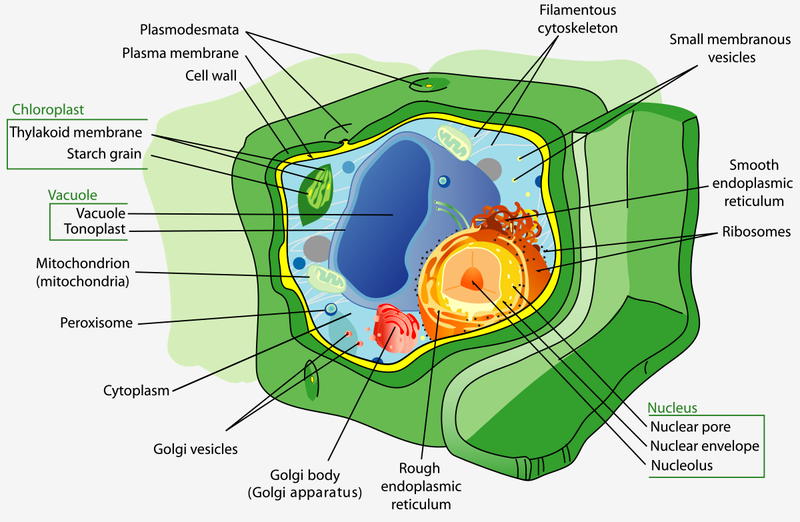 Source: Public Domain https://en.wikipedia.org/wiki/PlantDiagram of a plant cell with labels pointing to: plasmodesmata, plasma membrane, cell wall, Filamentous cytoskeleton, small membranous vesicles, smooth endoplasmic ribosomes, rough endoplasmic ribosomes, golgi body, golgi vesicles, cytoplasm, peroxisome, mitochondria, vacuole, chloroplast and at the center is the nucleus, surrounded by the nuclear pore and nuclear envelope. This diagram of a plant cell can convey information more efficiently and effectively than text. Images like charts, diagrams, illustrations and graphs can support understanding of large complex systems and data more clearly and easily than text. 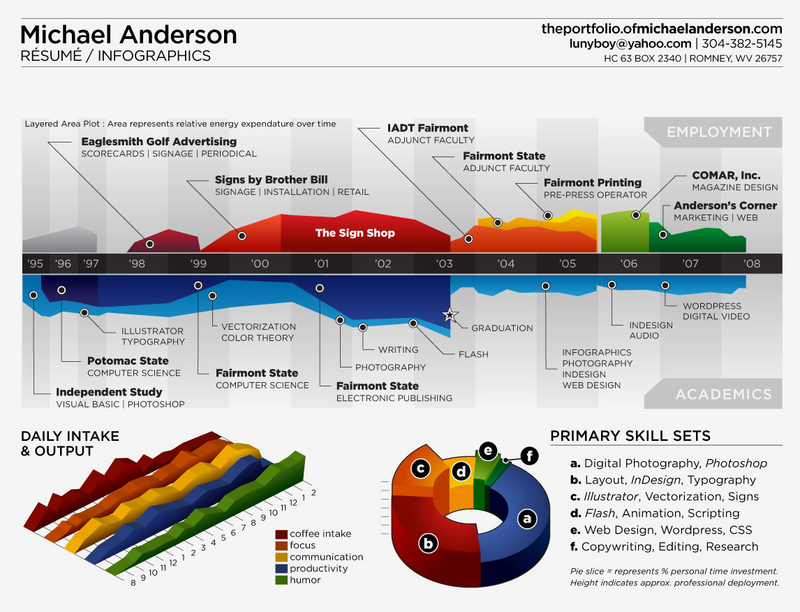 An example of an info graphic showing a Mark Anderson's resume with address and contact information, timeline with places of employment and education and primary skill sets. The resume also includes a humorous "Daily intake and output" section describing things like coffee intake and communication throughout his day. The infographic above is complex and contains a great deal of text. The long description for the image conveys the main parts of the infographic because the details are not necessary to understanding the infographic in this context. If the purpose of the infographic was to convey the details, a full description and reconstruction of the embedded text would be necessary. A dual image containing both a photograph and a diagram of a robotic arm. Below the arm is a board with lines crossing the center. The robotic arm is touching the board in the lower left quadrant. The horizontal line in the photograph is labeled x, and the vertical line is labeled y. The example image above demonstrates the use of alt text and one model of how to include long description for a complex image. Our brain decodes visual information much faster than text.2 Images can support narrative and expository content, as well as show dynamic processes, relationships, computations, and procedures. Photographs, illustrations, charts, graphs, geographic and concept maps, data visualizations, infographics, animated images, SVGs and visual math manipulatives are examples of images types. Many concepts are communicated more effectively with the addition of illustrations, maps, charts, and other types of visual objects. Images can provide alternate representations of concepts that may be challenging or difficult to convey in text only (e.g., anatomy without illustrations or history without maps). Make sure all images are accessible. See the Accessibility at a Glance resources at the top of this page. It is critical to follow copyright and attribution guidelines. Put critical information in the text rather than in image. If you must have text in an image, make sure it is also represented in an accessible way. If images are used to represent mathematical equations, make sure those images have long descriptions that describe the mathematical notation explicitly. You may also choose to represent complex math equations in MathML, a specialized mark-up language that describes mathematical notations. Offering the choice for students to use images as a way to demonstrate knowledge can lead to creative and inspired outcomes. Many students may be motivated when given the opportunity to produce images. However, others may be intimidated by creating media, which can have negative impacts on their demonstration of knowledge. 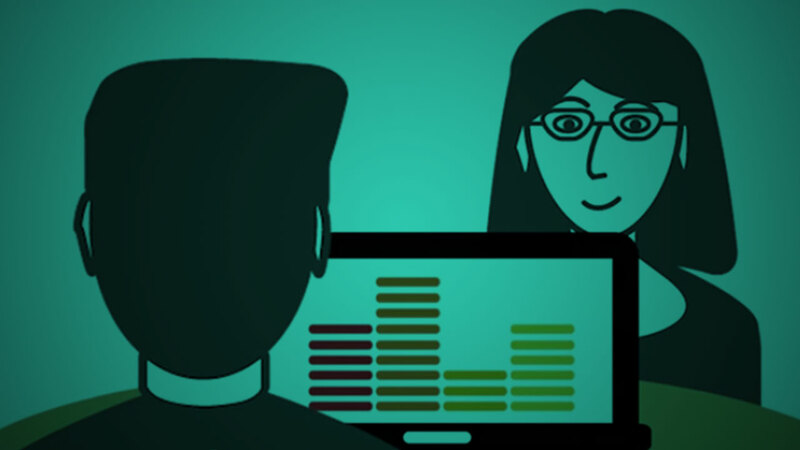 As the UDL principles suggest, consider using multimedia as an option for students to demonstrate knowledge, but offer other means to avoid inadvertently privileging, excluding, or disengaging learners. Provide information about attribution best practices and clear criteria for your evaluation of student-generated images, diagrams, photographs, infographics and other image types. SVG is a language for describing two-dimensional graphics and graphical applications in XML, as developed under the W3C process.